A common approach for handling the complexity and inherent ambiguities of 3D human pose estimation is to use pose priors learned from training data. Existing approaches however, are either too simplistic (linear), too complex to learn, or can only learn latent spaces from “simple data”, i.e., single activities such as walking or running. 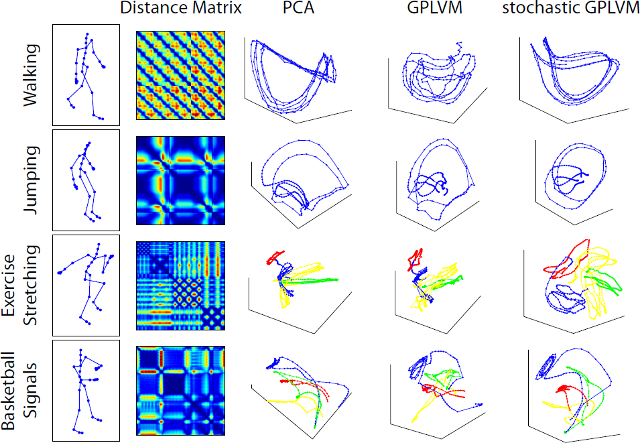 In this paper, we present an efficient stochastic gradient descent algorithm that is able to learn probabilistic non-linear latent spaces composed of multiple activities. Furthermore, we derive an incremental algorithm for the online setting which can update the latent space without extensive relearning. We demonstrate the effectiveness of our approach on the task of monocular and multi-view tracking and show that our approach outperforms the state-of-the-art. If you have questions concerning the source code, please contact Angela Yao. Yao A., Gall J., van Gool L., and Urtasun R., Learning Probabilistic Non-Linear Latent Variable Models for Tracking Complex Activities (PDF), Neural Information Processing Systems (NIPS'11), To appear. Yao A., Gall J., van Gool L., and Urtasun R., Learning Probabilistic Non-Linear Models for Tracking Complex Activities: Extended Experimentation (PDF).